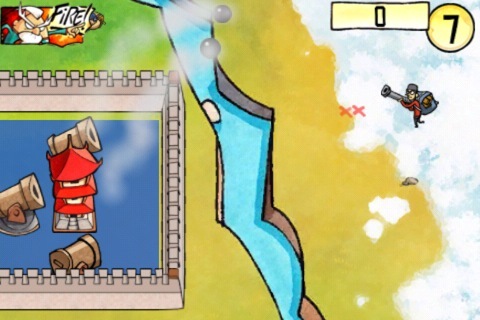 Back in January, Liv Games released Legendary Wars [99¢/Lite/HD], a game that took the tired side-scrolling castle defense genre and reinvigorated it with new gameplay ideas, a ton of variety, and a great sense of style and humor. 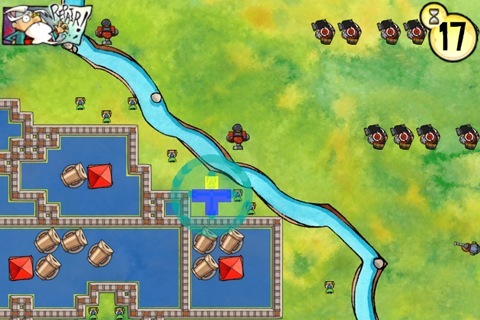 Now, they’ve collaborated with developer subzero.eu to once again enter war game territory, though this time as a revamped take on the classic Rampart strategy game formula with the just released Zen Wars [99¢]. It nails the Rampart gameplay too, and offers a sufficiently lengthy single player campaign and survival mode as well as a fantastic online multiplayer system through Game Center for up to 3 players. The basic gist of Zen Wars involves choosing one of three towers to place a barrier around, creating a protective base. You then place cannons within this base, and when finished use those cannons to fire on an approaching enemy threat. Enemies come in timed waves, and when the time runs out you’ll repair the parts of your barrier that were damaged during the battle as well as expand your base even further, or create new barriers around your other two towers. After repairing things, you’ll once again place your weaponry and then square off against the next wave of enemies, and thus the entire process begins again. What really forces the action along in Zen Wars is that everything is timer-based. You’ll only have a few short seconds to decide which tower to start building around initially, and then just a short time to place all your weapons. Cannon fire is also timed, so you’ll need to wait for a cool down period for each one before firing again to prevent endless spamming of cannon fire. Finally, the repair round is also timed, and this is where things can get really frantic. You aren’t able to choose which shape your repair blocks are, you’re just given them in random order. Shapes vary from single blocks, to long wall pieces, to Tetris-like angled segments. The perimeter wall around your tower can’t have any breaks in it in order to use the cannons placed within, and it can be incredibly difficult to use the pieces you are given to patch things up properly. The timer just compounds this, and can send you into a state of panic if the clock is ticking down and you’re not being given any of the proper pieces that you need. This panic will increase due to the one big downfall of the game, the finicky controls. You can pan and zoom around the battlefield using swipe and pinch gestures, and items are placed simply by dragging them where they need to go. On the smaller screen of the iPhone, things are pretty cramped, and with a timer ticking down there really isn’t much room for error. Constantly having to drag to scroll the view or erroneously placing items can eat up precious time, sometimes resulting in failure. This problem is greatly reduced playing on the larger screen of the iPad, and soon Zen Wars will be updated with universal iPad support as well as iPad exclusive modes and features. Until then, the game plays in full resolution in 2x mode on the iPad, and if you own one then I’d suggest playing on that device. You get used to the quirkiness of controlling things on the iPhone and iPod touch screen, but Zen Wars seems like a title that’s tailor made for the iPad, and I’m really looking forward to the native iPad support. While there is a ton of content and challenge on offer with the single player side of things, Zen Wars really shines in the multiplayer mode. Up to 3 players can connect locally or online through Game Center. Each player has a set of 3 towers, and the wall building and weapon placement plays out just like in the campaign, with the goal being to demolish the other players’ bases. Every player gets 3 lives, and the last player standing wins.Things can get pretty crazy with 3 players in the mix all trying to blow the snot out of each other, and voice chat is included for proper smack talking. Matches tend to run pretty long, sometimes upwards of 20 minutes, which is an eternity for a mobile title. But, if you have the time set aside to play, there aren’t many better multiplayer experiences on iOS than Zen Wars. If you were a Rampart fan back in the day and have wanted a portable version on the go, nothing else in the App Store even approaches Zen Wars. Even if you aren’t familiar with Rampart, the mechanics in Zen Wars are easy enough for anybody to grasp, and the strategy needed to be successful runs deep. Controls can be an issue, not because they’re poorly implemented but mostly due to the small screen real estate and the looming threat of timers. It’s far from a deal breaker though, and for one of the better and unique strategy offerings in the App Store, Zen Wars is a solid choice.